The leaked GTA V screenshot from May 2013 didn't have a HUD, either. I don't think it's "fake" per se, just maybe from another game, however the detail is pretty good to be fair as it's not a game that's already released as far as we know is it? Where you gone David.E, we need something in better quality! Meanwhile if someone finds a connection to another development somewhere online, let us know. Someone has already posted it on Reddit so it's going to spread quickly but we don't want to get false hopes up. Yeah at least it's something new to dissect. Get your detective hats on folks. 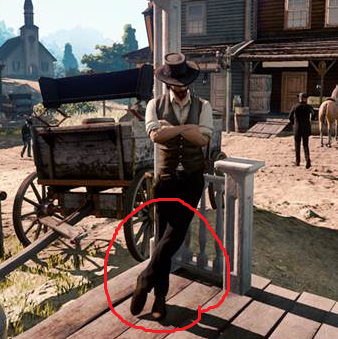 Only thing similar or almost identical to RDR 2 trailer i can find so far is the NPC legs/leaning animation. But hey, that hardly proves anything. Lol let us get some false hopes up! At least it's something new to talk about. If anything, this is managing our expectations because we all know the final game will look better. Guys this is the real deal. I was just about to mention the animation. There are horses also. It's RDR2. Holy sh*t. Theyre the exact same animation...this might be it HOLY sh*t! HEART ATTACK!!! It beats discussing fiscal quarters. what is the story behind this photo and where is it from exactly?, if you don't mind me asking. It's not a mod but I was saying maybe someone used the modding tools and level editor mod to make the scene in GTAV. 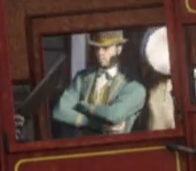 Does anyone know if that animation is in GTAV? because AFAIK you can't import new animations to GTAV. The colors seems to be either for game with sweetfx or other enb, or some camera pic. 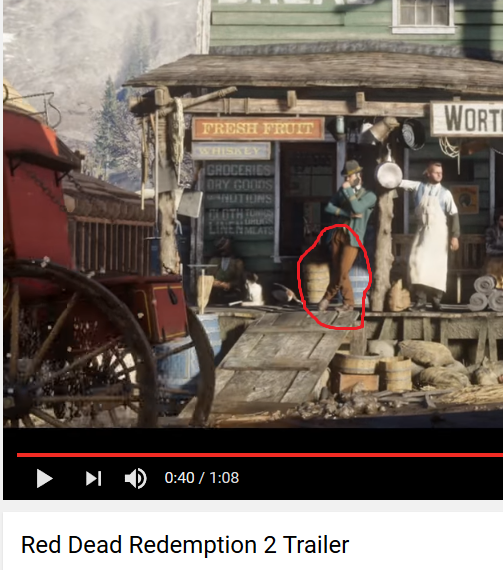 One second earlier in the trailer, In this frame the arms look similar as the 1st post picture. NPC moves his left arm to the chin afterwards. When i looked at the crossed arms in 1st post, zoomed in they look a bit weird though. Not the exact same animation. But the legs are almost exactly the same. Maybe it's a different variation of it. Somethings you just know are real, this is one of those things. certain, but it's close enough. Could be that they improved it, i mean it's been nearly half a year since the trailer so anything's possible. Isnt that Mt Chiliad on the right? If this is off-screen its hard to compare.